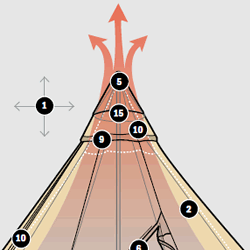 Proper height/width ratio is crutial to a tipi's design. 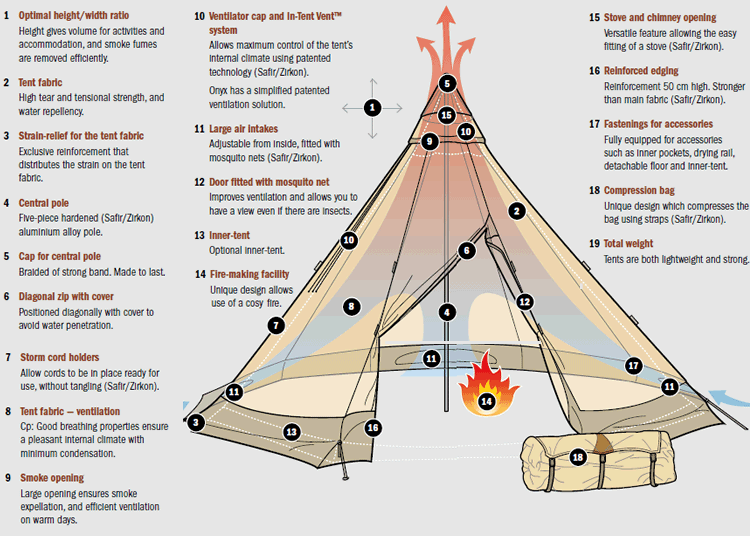 The correct height/width ratio, in combination with Tentipi's patented InTent ventilation system, assures the user maximum internal climate control. When used with an open fire inside, the correct height/width ratio assures that smoke and fumes are removed efficently. When used in hot climates, correct height/width radio assures that proper ventilation takes place as rising hot air is replaced by lower, cooler air. Proper height/width ratio also contributes to the special feeling one experiences inside a Tentipi Nordic Tipi, and provides lots of internal volume for activities and accomodation. The perfect tent fabric would be weightless, let all condensation pass through, be completely waterproof and super-strong. Of course, such a fabric will never be made. Different tent manufacturers use many different tent fabrics. Often the fabrics look alike when they are new, but the differences are quite substantial. A poor quality tent will let you down just when you need it the most. Tent fabrics intended for all-year-round usage must meet up to rigorous demands. Light, highly breathable and really strong 50/50 cotton/polyester fabric, creating a much better internal atmosphere than normally experienced in tents. The tightly woven fabric and high class impregnation gives high water repellency. The light tan colour creates a pleasing warm-colored atmosphere. Cotpolymex P is similar to Cotpolmex C, but with better shape stability and improved aesthetic appeal. To our knowledge, the absolute finest cotton/polyester tent fabric available globally. Highly breathable and strong 50/50 cotton/polyester fabric, creating a much better internal atmosphere than normally experienced in tents. The tightly woven fabric and high class impregnation gives high water repellency. The light tan colour creates a pleasing warm-colored atmosphere inside. One of the absolute strongest and finest lightweight fabrics available on the tent market. Very light, waterproof fabric manufactured from nylon 66. Ripstop reinforced, silicone-coated on both sides and UV-protected. The fabric is green and non breathable. Lightweight ripstop polyamide fabric. UV-protected and silicone-coated on both sides. A carefully chosen, light and very fine standard fabric. The fabric is rust red and non breathable. Lightweight ripstop nylon 6 fabric, PU-coated on one side. Carefully selected to be waterproof after prolonged use. The fabric is grey and non breathable. Light and very strong waterproof fabric which we use in areas of the tent that see a lot wear and tear. Manufactured of high-tenacity polyamide and coated with silicone. Lightweight floor fabric made specifically to resist wear and penetration. For this purpose, the fabric has a relatively thick polyurethane coating. Our coated fabrics are UV-stabilised. Our cp fabrics are a 50/50 cotton-polyester blend which is considerably more resistant to sunlight compared with similar types of cotton fabrics. Even so, do not expose the fabric to sunlight unnecessarily since cotton and most types of nylon (even if UV-stabilised) are eventually weakened by the sun’s ultraviolet light. Everyone knows how easy it is to punch a hole in a paper bag, and how easily the hole extends once it’s made. The same thing happens with low quality tent fabrics. Quality fabrics however, must not tear further even in the event of a rip. We have four different ways of solving this problem. 1. The impregnated cp fabrics have a 50 percent polyester mix which substantially strengthens the fabric. 2. A silicone coating increases the strength of the fabric 2–3 times compared with other coated fabrics. 3. Our very lightest fabrics are constructed using a ripstop technique. This means that reinforcement threads are woven into the fabric in a chequered pattern. Any tears or holes are stopped by these reinforcement threads but without making the fabric too heavy. 4. The fiber's material and quality play an important role. Less expensive cotton fabrics use short fibres which give poor strength. We use fabrics with longer cotton fibres. For the coated fabric used for the Safir light, we have chosen high-tenacity polyamide. This type of nylon has a different molecule structure, which makes the fibre more than twice as strong as ordinary nylon. Tear strength varies greatly between the tents available on the market. In fact, it is quite common for some manufacturers to use fabrics that have only 1/6 of the tear strength of our most advanced fabrics! There are two ways of making a fabric waterproof. 1. The fabric is impregnated with an agent that increases surface tension which in turn prevents water droplets from penetrating the fabric. 2. The fabric is given a coating which is completely waterproof. The quality of this treatment is measured in how well the coating binds with the fabric’s fibres. Even really cheap fabrics can be relatively waterproof when new but after being used for a time, the difference becomes apparent. Impregnated fabrics breathe and let out condensation straight through the fabric. Coated fabrics do not. If you want to buy a Nordic tipi of lightweight material and without an inner-tent, you will manage quite well in some circumstances. For instance, in the forest where the wind won’t shake the fabric, condensation will run easily down the fabric to the ground due to the slanted construction. Normally, condensation is not a problem in dry weather either. However, we always recommend using the inner-tent. Considering the complex nature of the practical and weather requirements placed on a tent, we have chosen fabrics that best meet these various requirements and needs. Guarantee against material faults in accordance with current legislation in each respective country. Guaranteed water-resistant for 12 months. However, please note that an impregnated, non-coated fabric is not guaranteed to resist rain in combination with a strong wind because then the water droplets hit the fabric with such a high speed that they sometimes overcome the impregnation’s water resistance. Guarantee does not apply for damage arising through accidents, incorrect care or careless handling. Normal wear and tear or damage caused by the sun’s ultraviolet radiation is not covered by the guarantee. Fabric stress relief. All tent designs place fabrics and seams under stress, especially during storm conditions, and it is the tent designer’s job to ensure that these stresses don’t exceed the fabric/component specifications, or exceed the manufacturing processes like seam stitching. Tentipi achieves this through their use of the best materials and manufacturing available, combined with carefully contoured and shaped panels which spread rather than concentrate stress. Critical areas are given extra protection through the use of reinforcied fabric webbing. This is the construction from which the tent itself is suspended. We use a high quality braided nylon, chosen for its strength and durability, which has proven itself over many years of use throughout our Adventure Nordic tipi range. We pay particular attention to the main door zip. Heavy duty, and with a broad storm flap and additional seam stress protection in the form of a strong triangular fabric web where the zip meets the main fabric panel. Diagonal zip - If the zip was otherwise positioned vertically on the fabric, rainwater would gather and go through. Cover - Thanks to the diagonal positioning, the zip cover makes the rainwater pass over the zip without penetrating. 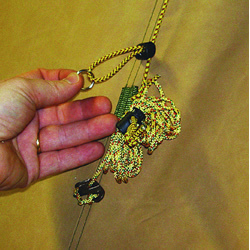 Tentipi®: This is probably the strongest storm cord fastening on the tent market. The hole can withstand a load of more than 60 kg. This is achieved through extra reinforcements at both ends of the hole itself. (Ordinary buttonhole bands are usually weaker). Very large smoke opening ensures smoke expellation when using with an open fire inside, and very efficient ventilation on those warmer days. 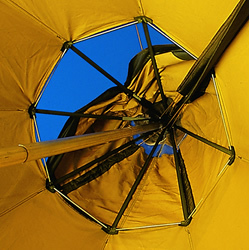 Tentipi's patented In-Tent Vent™ system allows for maximum control of the tent’s internal climate and provides the user with a number of unique advantages. This ventilation management system is one of the design features that put Tentipi® Adventure Nordic tipi's in a class of their own. The ventilator cap is opened or closed by simply pulling on drawcord(s) to open, or releasing the toggle on the drawcord(s) to close. 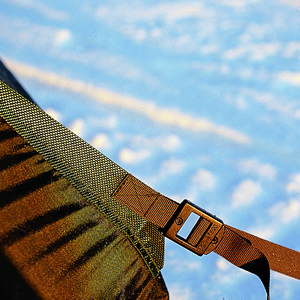 The user can chose to pull just one or two drawcords for a little opening, or pull them all open for maximum ventilation. Ventilation on boiling hot summer mornings. You don’t even have to get out of your sleeping bag in order to adjust the cap! 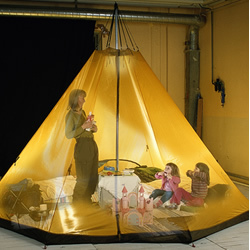 Mosquito-free ventilation on warm summer days and nights, even when not using an inner-tent. Then you just open the small top ventilator cap. Stops mosquitoes from coming in as the fire goes out. You close the large cap but continue to let smoke out through the open top ventilator cap. Dry and pleasant internal climate thanks to the airing of damp and condensation (caused by, for instance, steam from cooking or from damp clothes). Easy fire making. You don’t have to go out in the wind or bad weather in order to adjust the cap every time the wind changes direction. Maximum heat without troublesome smoke when making a fire in severe cold, thanks to the possibility of making fine adjustments to the smoke opening. Ventilator cap tighteners allow you to regulate how hard the cap is to be pulled down, before a storm, for instance. Tentipi® (Safir and Zirkon): The ventilator cap is permanently attached to the Nordic tipi and closes tight against the fabric. This keeps the tent free from mosquitoes and water even without an inner-tent. At the top of the cap there is a mosquito net and on top of that there is another small cap, the top ventilator cap, which is regulated in the same way as the big one. 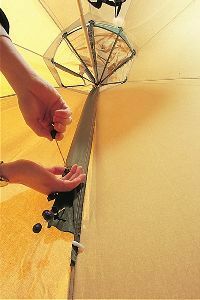 Tentipi® (Onyx): Onyx has a simplified patented ventilation solution. cooking or from damp clothes). Adjustable from inside, fitted with mosquito nets (Safir/Zircon). 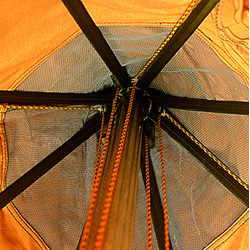 Tentipi®: Ventilation is extremely good on warm days thanks to the big smoke opening, the large air intakes fitted with mosquito nets, and the net-fitted door. Every air intake is easily adjustable from inside. The air intake roof can be closed to make sure that no rain gets in. The exchange of air is also affected by the size of the air intakes and air outlets. Natural ventilation is affected by a number of interacting factors. The bigger the height difference between air intakes and outlets, the better. Warm air is lighter than cold and therefore rises, and the taller the warm air pillar is, the stronger the airflow will be. This means the air does not need to be warmed up as much in order to be exchanged which is nice for those in the tent. Thanks to the tallness of Tentipi® Adventure Nordic tipis, natural ventilation works much better than in any other ordinary tent. 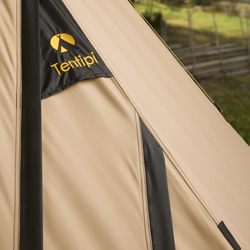 Tentipi® inner-tents are available in three grades — Pro, Comfort and Base. Any grade of inner-tent can be used with any of our tent models size 5, 7 and 9. 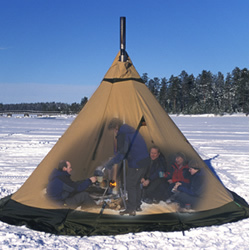 Teflon impregnated ripstop fabric gives protection against condensation which is especially important for Nordic tipis made of lightweight material. Heat sources function more effectively as more heat is retained when there is a double fabric layer. 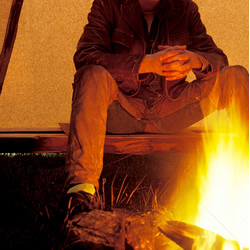 Because it is possible to have a fire or stove inside the inner-tent, there are no disadvantages. 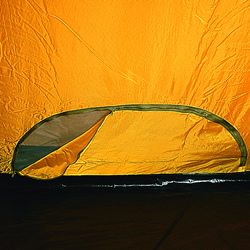 However, this does not apply for the Base inner-tent since its floor cannot be opened. Inner-tents can be put up together with the Nordic tipi, or can be easily detached by using the reliable quick fastenings. Closable insect net over the smoke opening; fits tight around the central pole. Reduces the risk of damaging the net when using a stove or open fire. The fire. 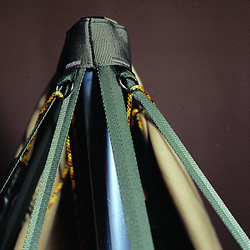 This single element alone differentiates the Nordic tipi from other tent designs. If you’ve ever experienced camping in cold, damp, miserable conditions, the cosy atmosphere created by an open fire inside is quite remarkable by comparison. There’s an extra level of safety too, an unexpected storm, or very cold temperatures can have horrible consequences. The ability to simply open the smoke opening and build a fire inside can literally be a life-saving feature! Versatile feature allowing the easy fitting of an Eldfell wood burning stove. One of the main principles behind the Tentipi® Adventure Nordic tipi is versatility — that you should be able to manage with just one tent. They can be used with no heat source on warmer days, with a stove or open fire when it's cold outside.